Wallet wars are here to stay, and the competition is just getting tougher. All this is in favor of the consumer because the many the e-wallet companies, the more the benefits the consumers are gaining. Two of these companies are Amazon which has Amazon Pay and Apple which have Apple Pay. Let’s see the differences between these two and extrapolate on how the differences are set to benefit the consumer. Amazon pay has seen formidable growth recently, but despite the recent growth, it is yet to catch up with Apple Pay in the market share. Apple Pay is the leading service in the top 10 thousand sites, top 100k sites, and the entire web. Apple Pay is dominating in most of the top sites on the web. When we look at the website categories, Apple Pay has better usage and categories coverage including arts and entertainment, shopping business and industry, clothing and more than 200 other categories. Amazon Pay leads in human resources, ask an expert, computer hardware, disabled and special needs and 3 others. The difference in market share gives the consumer the laxity to choose the most convenient services and also the most frequent websites they use. The consumer is the one to decide what is best for then depending on the services. The market share for these two companies is dictated by the geography of the places the services dominate. Apple Pay leads Amazon in most of the countries that have dominated the e-commerce world. Some of the countries where Apple Pay is leading include United States, Canada, Australia, United Kingdom and 171 other countries. Amazon Pay is not left so far behind by Apple Pay since it is leading in countries like South Africa, Germany, Andorra, French Polynesia and others. The advantage Amazon Pay has here is that it is dominating in countries that are slowly by slowly embracing e-commerce. While Apple Pay is dominating where there is no more expected growth since the market here is grown almost to their full potential. This means that Amazon Pay has a higher chance of increasing and dominating a more significant market share as compared to Apple Pay. This is a straight difference between these two services, and this is a chance for one of them to dominate. Apple Pay is a closed system that works only on iOSdevices, and this is a huge limitation and leaves it vulnerable to the other services. This means if you have android devices or any other devices apart from iOS devices you are locked out. 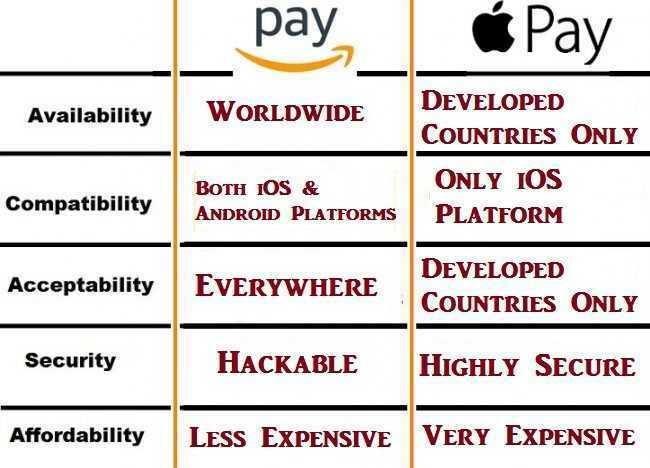 Amazon Pay is a better option as compared to Apple Pay, because it is not locked from other devices and if the market share gets broader, they are probably going to grab a bigger share. According to a report done by Fung Global Retail and Technology, Amazon Pay has more than 33 million users as of February 2017 while Apple Pay has approximately 87 million users. The vast U.S market represents a larger target for Amazon Pay with consumers having completed 33.8 billion transactions in 2015. Since Apple Pay has a good part of the market locked out, Amazon Pay is estimated to swipe in and scoop that specific part of the market increasing its number of consumers. This is one of the places where Apple Pay trolls Amazon Pay. When you sign in to your Amazon account, several precautions are taken to protect your account. First, when signing in, you sign in using a secure server connection, and then they use Transport Security Layer/Secure Socket Layer that has 128-bit encryption which is the industry standard in secure server protection. Your Amazon account is protected by a password that the user creates when opening and he or she is given guidelines when creating the unique password. Apple Pay, on the other hand, is built with integrated security in both hardware and software to make it easy and a safer way to pay as compared to paying with your cards. Apple Pay protects your personal information in that it doesn’t collect information that can be followed back to you. One of the security features Apple Pay has is a passcode set on your device and a Touch ID. Before completing any transaction, the device requires biometric verification using the Touch ID you have set up. This is secure such that if you have a passcode set and a Touch ID verification set too. No one can access your account even if they hack in your account or have your passcode because the account will require biometric verification. Apple Pay also uses Near Field Communication (NFC) technology in stores that accept contactless payments. Improvement of services between these two companies have one mutual beneficiary, and that is the consumer directly.